As you may know, HON is the largest operating company of HNI Corporation, the second-largest office furniture manufacturer in the world. Inspired by practicality and invested in understanding the needs of our customers, this translates into HON furniture being used by real people, in the real world, to produce real solutions. You just have to take a moment to spot it. The customer catalog merchandising team at HON has affectionately named this activity “HON Spotting.” HON Spotting is when you take notice of a HON product and share your find with friends. We have found that it is a great feeling to recognize HON product and see the purpose it is providing in the real world. Here are some of our group text exchanges from the past few months. You can also reach out to your friends and family to get them involved. 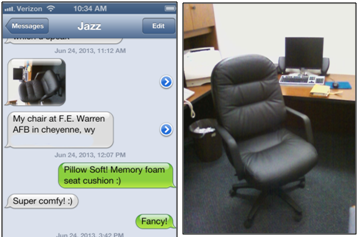 A quick text returned this beautiful Pillow-Soft® being used by Lt. Jasmine Tesdahl at F.E. Warren Air Force Base in Cheyenne, Wyoming. So take a moment to do some HON Spotting of your own. You can join us in feeling proud of the HON brand and the solutions that are used each day. Tag your pictures of HON products in the wild on Twitter, Instagram or Pinterest with #HONSpotted or post them on our Facebook page!